TAMPA, FL -- Dozens of people protested outside Media General's headquarters in Tampa on Wednesday evening. 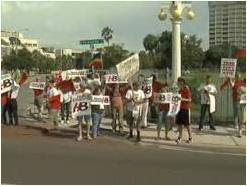 Protesters waved signs that featured a modified WFLA logo that read "Channel H8." The demonstration was over the decision by WFLA Channel 8, which is owned by Media General, to broadcast an infomercial that the protesters say was anti-gay. The program, called "Speechless: Silencing the Christians," was aired on WFLA on the night of St. Petersburg's Gay Pride parade. The American Family Association, a conservative Christian organization that opposes gay rights, paid WFLA to air the segment. The protest coincided with a visit from the national president of Media General, which also owns the Tampa Tribune and TBO.com.